Parent(s) and their adolescent children (4th grade and up) to be chosen by interview. 12-20 persons total. The Limão Verde reservation of the Terena Tribe in the District of Aquidauana, Mato Grosso do Sul, Brazil. The primary activity during the trip will be conducting four (4) days of cultural exchange activities in the indigenous school around the subject of Easter aimed at sharing the gospel with the children of the community. There will be additional opportunities to minister in the local community and with the local indigenous church. Primary Objectives – 1) Assist local missionary team in developing and executing an evangelistic Vacation Bible School/Kids Camp program that will also attract children not already frequenting the ministry. 2) Encourage and energize national missionaries and their ministry. Secondary objectives– 1) Give parents and children together an experience in international missions, an opportunity to practically carry the gospel message to another people group as a family, and 2) emphasize the importance of serving Christ with your children as a most valuable discipleship tool. 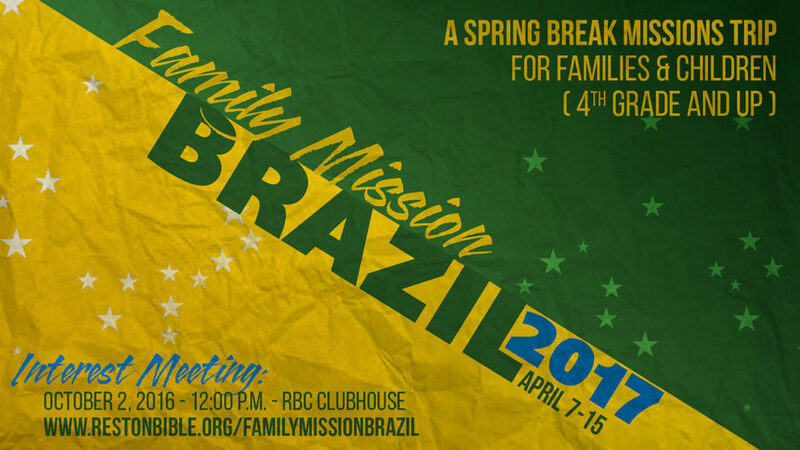 Missionaries: We would be serving with RBC Missionary Eduardo Ribeiro and other national Open Arms Worldwide missionaries along with the Terena Church. Learn more about the host organization, Open Arms Worldwide. Cost? This is still a rough estimate, but approximately $1,800 to $2,000/person which would include airfare, travel in country, housing, meals, and material. A $150 deposit will be due upon acceptance to the team. Each family unit would be responsible for raising their support.